While hydrogen is often talked about as a pollution-free fuel of the future, especially for use in fuel cell electric vehicles, hydrogen can be used for much more than zero-emission cars. In fact, from enhancing the flexibility of the grid to greening agriculture, hydrogen could play a major role in a clean and resilient energy system. In an effort to bring that vision to fruition, the Department of Energy (DOE) has launched "Hydrogen at Scale," or H2@Scale, an initiative that explores the potential for wide-scale hydrogen production and utilization in the United States to benefit many sectors of the economy. In support of the initiative scientists at Lawrence Berkeley National Laboratory (Berkeley Lab) have been increasingly turning their attention to hydrogen generation. "Hydrogen is a very nice intermediate energy carrier" said Berkeley Lab researcher Adam Weber. "There's a big focus now to use hydrogen for other end uses, not just fuel cells and vehicles." The problem with hydrogen is, while it is the most commonly occurring element on our planet, it does not exist anywhere in pure form. That means it must be produced from other compounds. Currently, the vast majority of hydrogen is produced by extracting it from natural gas, a process called steam methane reforming. While it is inexpensive it releases large amounts of carbon dioxide in the process. For hydrogen generation that is cheaper, more efficient, and less polluting Berkeley Lab researchers are pursuing several alternative technologies, leveraging their capabilities in fuel cells, materials, and other areas. These include electrolysis, which uses electricity to split water into hydrogen and oxygen, and photoelectrochemical (PEC) cells, which use sunlight to do the same thing. If the electricity is generated by renewable energy then electrolysis is essentially pollution-free. "We believe if you look at the way solar and wind are going, electricity prices will be much lower in the future, and at off-peak times, the price can even go negative," Weber said. "If we can utilize that electricity in an intermittent electrolysis unit, we can start producing some very inexpensive hydrogen." As use of wind and solar grows, an electricity surplus will become a problem for utilities. "Electrolysis becomes a good way to use excess electricity—it's been shown to be a very inexpensive way to do load leveling," said Berkeley Lab researcher Nem Danilovic. As lead of the Energy Conversion Group at Berkeley Lab and a deputy director of HydroGEN, a DOE consortium of national labs focused on advanced water splitting materials, Weber is overseeing a number of projects for both low-temperature and high-temperature electrolyzers. Electrolysis is in commercial use today, but the challenge is to make it more efficient and less capital-intensive. Like fuel cells, electrolyzers consist of an anode and a cathode separated by an electrolyte. "We have extensive experience in researching fuel cells, and we are leveraging that for electrolysis as well," said Danilovic. "A lot of the same tools and techniques that were developed for understanding membranes, catalysts, modeling are being leveraged to apply to electrolyzers and hopefully we can quickly decrease the cost of hydrogen generation." Berkeley Lab's hydrogen generation research is also getting a boost from the capabilities developed at the Joint Center for Artificial Photosynthesis, (JCAP), a DOE Energy Innovation Hub established in 2010 to advance solar fuel research. Building on work that JCAP researchers at Berkeley Lab did on PEC cells—splitting water into hydrogen on one electrode and oxygen on the other—Weber and his team are further refining the cells to bring down the cost and integrate them into devices. "JCAP demonstrated high efficiencies for taking sunlight and getting bubbles of hydrogen and oxygen," Weber said. "We still need to work on durability and cost, but we built up a lot of capabilities in surface science, catalysis, integration, and electrocatalysis. A lot of those capabilities have been transferred to our hydrogen work." Other research projects include a perovskite solar-to-hydrogen generator, a solid oxide high-temperature electrolyzer, as well as more basic materials research as part of the HydroGEN Advanced Water Splitting Materials consortium, which is led by the National Renewable Energy Laboratory. "The materials – that's where we think there can be innovation, in terms of efficiency and also cost," said Weber. "We're working on everything from ab initio calculations of catalysts to multiscale modeling at the cell level, analyzing membranes, doing surface functionalization and surface properties, to benchmarking." In addition Berkeley Lab scientists are developing tools and analysis to accelerate the research and development process, including doing techno-economic analysis for grid integration, benchmarking the technologies against each other in order to have common metrics and goals, and developing a repository of materials data that scientists can use as a research tool. Berkeley Lab is also part of another DOE consortium, Hydrogen Materials—Advanced Research Consortium (HyMARC), led by Sandia National Laboratories, which is working on safe and cost-effective hydrogen storage. Scientists from Berkeley Lab's Molecular Foundry, a DOE Nanoscale Science Research Center, are working on several HyMARC projects and recently led a study on magnesium nanocrystals wrapped in a layer of graphene, which showed great promise for storing hydrogen safely and at high densities. Researcher Jeff Urban leads HyMARC for Berkeley Lab. 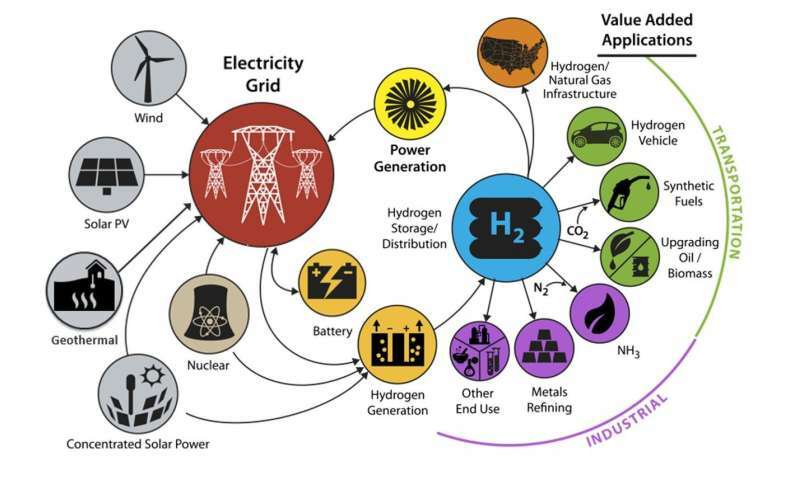 While there are still science problems to overcome Weber and Danilovic, both in Berkeley Lab's Energy Technologies Area, see great promise for hydrogen to play a role in industries from transportation to heating to food production. Modern agriculture, for example, is heavily reliant on fertilizer, of which ammonia, or NH3, is a key component. "The hydrogen for ammonia is derived from natural gas," Danilovic said. "Using low-cost hydrogen from electrolysis could provide market opportunities for stranded assets like curtailed wind and industries such as fertilizer production." By enabling wide-scale production and utilization of clean hydrogen, H2@Scale addresses key issues, such as grid resiliency, energy security, and emissions reductions. "To address multiple energy and transportation needs, hydrogen is an enabler because we can make it from various inputs, including nuclear power or renewable energy such as sunlight or wind power," Danilovic said. "We can take clean electricity and use it to make hydrogen, a pretty flexible commodity that can then be used in various industries, and in the process, enable energy security, resiliency, and economic growth."